What does the average person think of when they plan a Date Night? Getting dressed up, maybe a little bling. Dinner at an expensive restaurant, then go to the theatre or a catch a movie... followed up by a little bar hopping? What does the average CRUISER think of when they plan a Date Night? Finding something in their "closet" that is presentable and not caring that it's Fall and all the clothes they have to choose from have a decidedly "tropical" theme. Finding a restaurant that's cheap in a tourist town can be a challenge... and for entertainment? 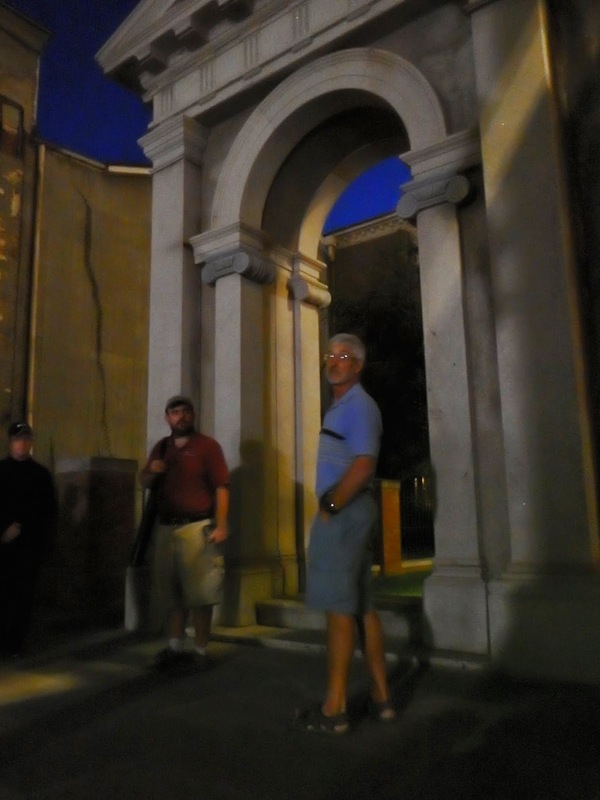 Why not cruise through a cemetery and then tag along for a Ghost Tour? Perfect! 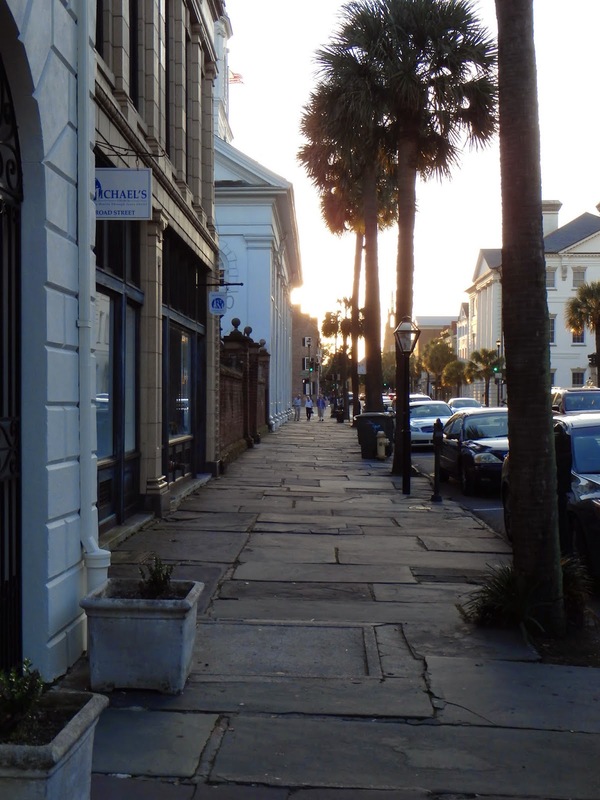 We started off with an early dinner in Historical Charleston, SC. Our first choice, Joe Pasta, was closed for some sort of repairs, so we wandered across the street to Juanita Greenberg's. We should have known that the chance of getting a "real" Mexican dinner in South Carolina was a stretch... But our server was sweet and we didn't leave hungry... just a bit confused. 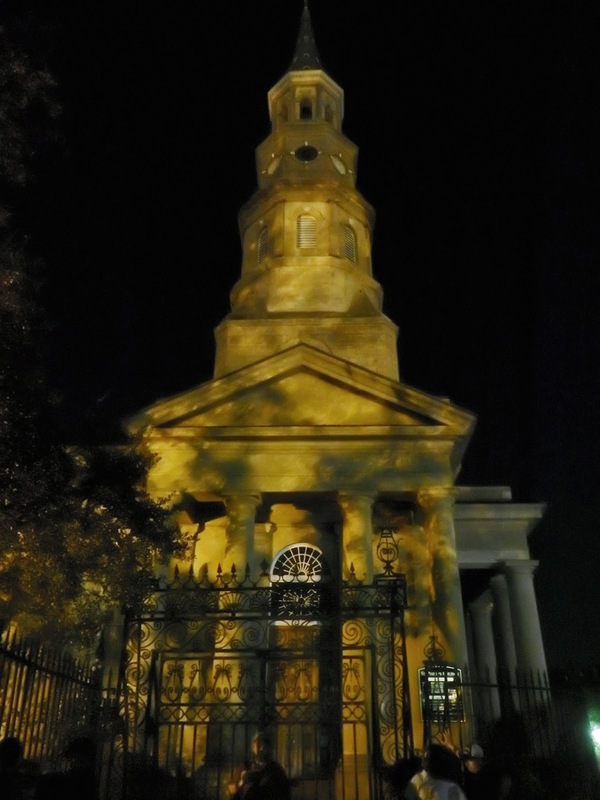 The time disappeared as we lost ourselves in the beauty and history of just one of many Churchyards in and around the Charleston area. For me, it's more of an intangible thing... I love the feeling of being in and around these headstones and tombs. I think about the decades that have passed leaving their mark upon these worn stones. Looks kind of Ghostly before we even got started! We got thrown out of the Churchyard as the sun started to set. Time to move on to our meeting place in Washington Square Park. Darkness fell and a group of about twenty people gathered. Our guide from Old Charleston Walking Tours collected us all and off we went. I'm really surprised that I even got Bruce to agree to do this. He's very practical and there's not a supernatural bone in his body... 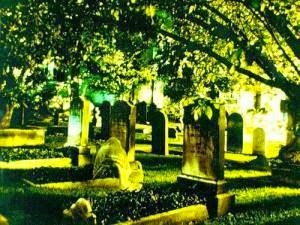 But once you get over any lingering "cheesiness", hearing about local haunted spots can provide a perspective that is different from the history that you normally hear about in a place like this. The first stop is where introduced to the story of Lavinia Fisher. She was reportedly the first known woman serial killer, and later the first white woman to be hanged... Until then, the more gentle method of burning at the stake was reserved for the delicate white woman... The story goes that Lavinia now continues to haunt the Old Jail where she and her husband were kept while awaiting their deaths. We didn't visit the Old Jail, but we did stop outside the gates of the Unitarian Church Graveyard. The connection here goes like this... The Fishers were not buried in a cemetery... they were buried in a Potter's Field near the jail. Behind these gates lies the body of Anna Ravenel. You might remember the name as it graces the Ravenel Bridge that we traversed on our way to Sullivan's Island. Anna fell in love with a young and handsome soldier, Edger A. Perry. Her family had other plans for their daughter than that she marry a poor man, and so they met secretly until her father put a stop to it by having Perry transferred away... Poor Anna died soon thereafter and her father buried her here in the Unitarian cemetery. He bought several plots around her to keep her suitor from knowing exactly where she was buried, thus thwarting the lovers even in death. What ever happened to the suitor? He left the Army after dropping his pseudonym and died at the age of 40 after aspiring to be one of the most important literary writers... Edgar Allen Poe. His last complete poem was written about Anna... who continues to haunt the Unitarian Cemetery. We next paused outside the popular Poogan's Porch Restaurant, where it is reported that the ghost of Zoe St. Armand, former resident of the old home, can be seen haunting the halls and the restroom. The haunting never stops! The Meeting Street Parking Garage is reportedly haunted by the ghost of an unknown Quaker, left to walk the lonely garage forever after it was built atop of a Quaker cemetery... 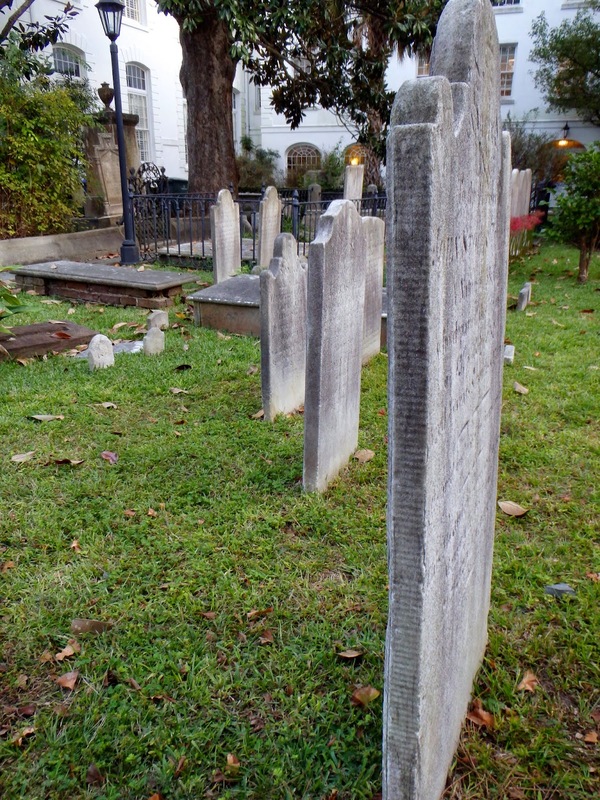 They were supposed to have moved all of the Quakers buried there... maybe they missed one? Nothing is left to mark the cemetery but this iron fence and gate.... and the one ghost of course. The story goes that a young wife, Sue Howard gave birth to a stillborn child. 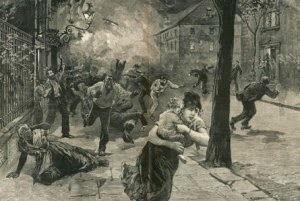 Sue became mortally ill and died six days after the death of her child. She can be seen huddled beside the grave of her child, sad for all eternity. Only THIS one caught the figure of the mourning mother as she huddled next to the grave. Our tour ended in a dark alley. Well, it wasn't so dark actually. Philadelphia Alley. The place goes by other names as well, our guide chose Bloody Alley as it is most remembered for being a place where gentlemen came to have their duels. The long narrow passageway provided the perfect place for it. Hidden from outsiders, the duelists and their seconds could perform their worst in peace, spraying the blood of the fallen on these walls. There is a story about a young Dr Joseph Brown Lad who met the beginning of his end here. After becoming a Dr in order to impress the father of his love, Amanda, his own friend began to slander him. This ended in the duel at Philadelphia Alley where the young Dr was mortally injured. He was carried back to his rented rooms at 59 Church Street, where he died ten days after the duel. He still can be heard tromping up and down the stairs, and whistling... at the Church Street residence. So it is the ties that bring history together with the present, mixed with the ghostly people who once lived in the place where we now happily go about our days. Maybe you've never had any type of experience with the supernatural... maybe you have. But I think most of us enjoy a little toe-dipping into the possibility that there is another answer to the question... What DOES a Cruiser like to do on Date Night?